Sunday November 2nd 1924 Harry came for me early and I found Stella here. She went home at 10.45. After the family had been to the cemetery. Harry took Laura, Edith and me to church and Harry took Mabel and Lydia to ride. After dinner Laura and I took a long ride with Will McKinstry and family. Wrote to Hattie. Harry and Mabel home soon after dinner. Monday November 3rd 1924 It was a short forenoon. I ate dinner before noon and went to Peoria with The Woolfs. I got beads to make a bag. Home about six oclock Edith went back to her school today. The weather fine as it has been for several days. Tuesday November 4th 1924 Election day. I lose my vote. I did some work upstairs in AM and threaded beads. Letter from Hattie. I write Warner McCall as I hear from him about how we did not see each other Thursday. Went up town to mail letters. 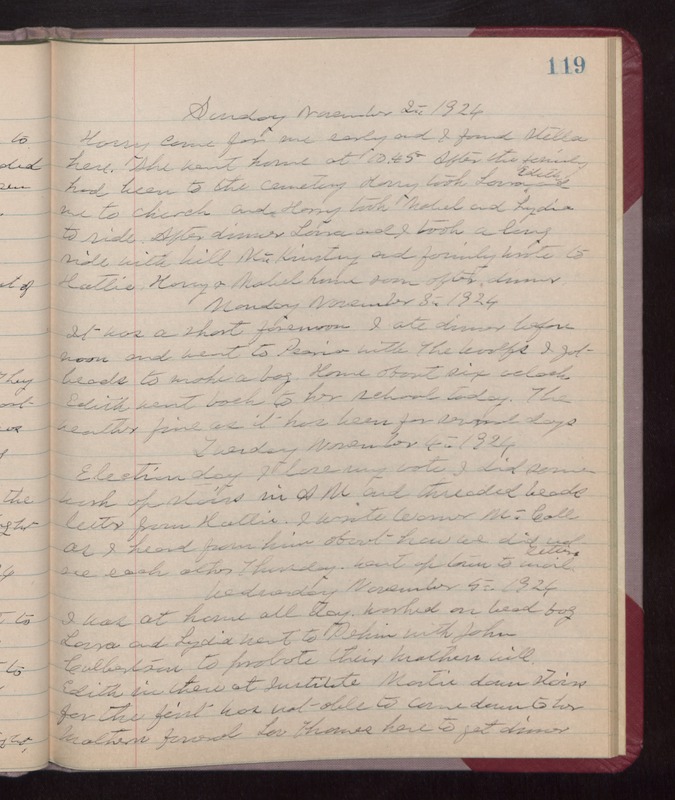 Wednesday November 5th 1924 I was at home all day. Worked on bead bag. Laura and Lydia went to Pekin with John Culbertson to probate their Mothers will. Edith in there at Institute. Martie down stairs for the first. Was not able to come down to her Mothers funeral. Lou Thomas here to get dinner.